On November 1, 2009, Local 102 amalgamated with IBEW Local 2066. We are now proud to have Mike Scotto as part of our team. Mike served as Business Manager of Local 2066 and will continue his duties under the umbrella of IBEW Local 102. Mike has forged a relationship with many companies through out the state, it is a relationship we are proud of and look to build on in the future. 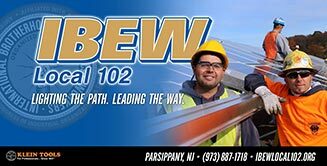 If you have any questions about our manufacturing division please do not hesitate to contact Mike Scotto at our Parsippany office, 973-887-1718, or you may reach him by e-mail at mscotto@ibewlocal102.org. The following is a list of companies and towns represented by Local 102. We are proud to be partnered with employers that value their employees and reward them with union representation.